Hawaii, known by several nicknames including the Aloha State and Paradise of the Pacific, is the 50th state of the U.S. It's one of the smallest and least populated of the states but has one of the longest coastlines due to the fact that Hawaii is made up of eight major islands and hundreds of smaller ones. This state is one of only two US states to be located in the aptly named Hawaii-Aleutian Time Zone. The state of Hawaii covers almost 137 islands. There are eight major islands, named Hawai'i, Maui, O'ahu, Kaua'i, Moloka'i, Lana'i, Ni'ihau, and Kaho'olawe, and then several smaller islands, atolls, and islets. Despite being part of the United States, Hawaii is technically located in the geographic region of Oceania. It also happens to be the only US state to be made up of nothing but islands. The capital city of Hawaii is Honolulu, which is also the state's largest city and boasts a population of approximately 350,000. Hawaii is a very unique state with a fascinating history, having once been an independent nation. It had its own monarchy and was known as the Kingdom of Hawai'i until US citizens overthrew the system and eventually made Hawaii a US territory. Hawaii then became a state in 1959. Well known for its rich wildlife, tropical climate, stunning beaches and volcanoes, Hawaii is a tourist hotspot and an area of particular interest for scientists. Due to its location and warm weather, Hawaii's economy is heavily influenced by tourism. Tourism contributes around 25% of the gross state product in Hawaii, with people coming from all over the world to visit the islands, appreciating the ocean views, sunny days, and spectacular beaches. Hawaii also has a profitable agriculture industry, focusing on produce like honey, pineapples, and sugarcane. The state is also known for having the highest tax rates in the whole of the US and having some of the highest general living costs too, with many homes in the state often reserved for exceedingly wealthy stars and businesspeople. Hawaii also enjoys a unique culture, with aboriginal Polynesian roots influenced by European and Asian visitors. Time zones were first introduced in the US in the late 19th century. At that time, Hawaii was a US territory, not a state. Before Hawaii became a state, GMT -10:30 was the standard time in the area. By the time Hawaii did become a state, on August 21 of 1959, the time zone system had been fully installed all around the US. Due to the fact that Hawaii is so far away from the continental United States, it needed its own separate time zone and couldn't fit in with the time zones used through the other states. It was therefore placed in the Hawaii-Aleutian Time Zone. Interestingly, cable TV networks in Hawaii aren't adapted to this time zone. On most channels, the state receives the west coast feed, meaning that the scheduled airing hours for many TV shows are completely out of sync with the actual time in the state of Hawaii. Hawaiian citizens and visitors have had to get used to this slightly odd system. As the name suggests, the Hawaii-Aleutian Time Zone covers the state of Hawaii and also some of the Aleutian Islands, located partly in Alaska. This means that Hawaii's time zone is shared with a small part of Alaska too, specifically the Aleutian Islands to the west of 169° 30' W. Some parts of French Polynesia and other islands also use the same time as the Hawaii-Aleutian Time Zone but aren't technically classed as being in the zone. The Hawaii-Aleutian Time Zone is ten hours behind Coordinated Universal Time (UTC). Daylight savings is used in almost all of the US but does not apply in Hawaii. In the Hawaii-Aleutian Time Zone, daylight saving time does apply in the Aleutian Islands but not in the state of Hawaii. In the Aleutian Islands, the time becomes nine hours behind UTC during daylight saving periods. 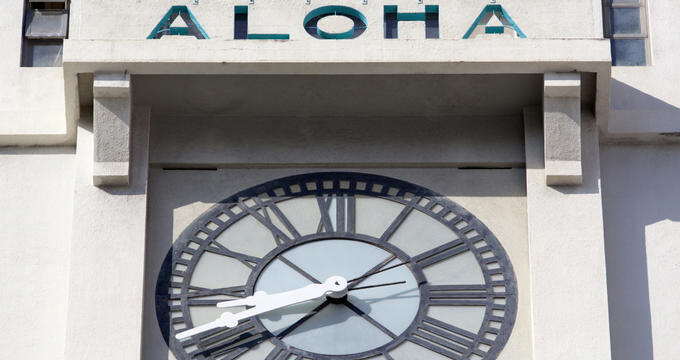 It was officially agreed that Hawaii did not need to use daylight savings as it is very close to the equator, meaning that sunrise and sunset times stay more or less the same throughout the year so the state would gain no advantage from using daylight savings. Arizona is the only other US state that does not make use of daylight savings.